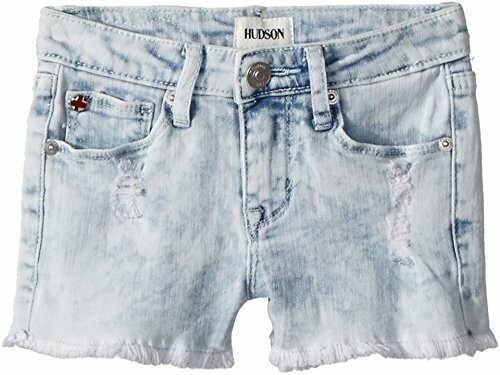 Hudson Toddlers' Size Chart Hudson Little Kids' Size Chart Hudson Big Kids' Size Chart The Hudson™ Kids Free Love Shorts are must-have jean shorts that will keep her stylish throughout the whole season. Semi-relaxed fit and a mid-rise on a comfortable stretch-denim fabrication. Bleached wash throughout with subtle destruction and a heart patch at the back waist. Five-pocket design flaunts the signature HUDSON triangle back. Tonal topstitching. Silver-toned hardware. Belt loop waistband. Union Jack brand tag at back right. Zipper fly and button closure. Frayed trim. 64% cotton, 34.6% viscose, 1.4% spandex. Machine wash cold, tumble dry. Imported. Measurements: Waist Measurement: 20 in Outseam: 7 1⁄2 in Inseam: 1 in Front Rise: 6 1⁄2 in Back Rise: 9 in Leg Opening: 11 in Product measurements were taken using size 4 Little Kids. Please note that measurements may vary by size. The Hudson™ Kids Free Love Shorts are must-have jean shorts that will keep her stylish throughout the whole season.